With two starting defensive ends departing, Iowa's trio of veteran tackles will be counted on in 2016. There are questions about the defensive end position for the Iowa football team with starters Nate Meier and Drew Ott departing. Which is why, aside from C.J. Beathard at quarterback and Desmond King at cornerback, Iowa's trio of returnees at defensive tackle could be the most important strength to put on the pads again for the Hawkeyes in 2016. Iowa returns incumbents in senior Jaleel Johnson and junior Nathan Bazata — the duo started all 14 games last fall — along with senior Faith Ekakitie, who played in 12 games as part of a rotation. Replacing multiple starters on the line is nothing new. Both Johnson and Bazata were rookie starters last season after Carl Davis and Louis Trinca-Pasat held those positions for many games. Sophomores Parker Hesse and Matt Nelson are likely to take up the starting jobs at end. "As a senior, you want to play your best football," Ekakitie said. "The more you play the better you should be. Those guys to the sides of us are getting better too. Last year, we went into it having lost guys from the year before (in Davis and Trinca-Pasat), but we found a way replace them. We lose Drew and Nate this year. If we’re going to be good we need to find a way to replace their productivity." Productivity happened for the defensive tackle group in 2015. Johnson recorded 45 total tackles, including 5.5 tackles for loss and four sacks. Bazata posted 42 total tackles with five tackles for loss three sacks. Ekakitie added 13 total tackles and 1.5 tackles for loss. The 6-foot-4, 310-pound Johnson especially emerged after playing as a rotation contributor in 2014. 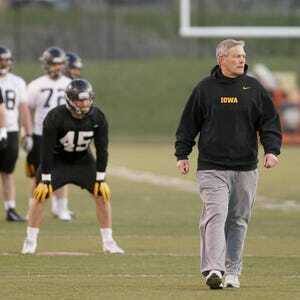 "I think the more that (Johnson) plays within our defense and does what he's supposed to do and be more consistent with that, that's where he's going to help the team," Iowa defensive coordinator Phil Parker said this week. "He's very powerful, very strong. He's a violent kid and we're excited about where he can go with his upside." Spring ball for Iowa will be capped off with an open practice at 1 p.m. Saturday in Kinnick Stadium. Johnson answered simply when asked what he wants to see from himself as spring comes to a close and with summer workouts on the horizon. "Finish spring ball on a good note," Johnson said. "… I’d like to be more of a consistent player my senior year. There are some things I didn’t do too well as a junior in my first year starting. (Want to be) better on pass rushing, more stopping the run too." The rotational component is a critical factor at defensive tackle, especially as the season progresses. Johnson, Bazata, and Ekakitie will get the bulk of the playing time. At a press conference last month, defensive line coach Reese Morgan also singled out junior walk-on Jake Hulett, who played in 10 games on special teams last year. "Fatigue does kick in whether you want to believe that or not," Ekakitie said. "With three guys rotating, it gives us fresh legs. If you have at least three guys that can produce and play at a pretty high level, that works in our favor." While other positions on the defense will be counted on to make plays or force takeaways, the tone is set up front by the defensive line — where it is ultimately nice to have a veteran presence on the inside at the two tackle spots. "Everybody needs to keep on getting better," Parker said. "I don't think you can sit there and say, hey, the defensive tackles have to make plays for the defense. That's just not the way it works. I think the guys we have in place right now are in good positions."